Advantages: Excellent artwork, superb collection of photographs, detailed cockpit drawings. It seems that some subjects are not meant for readers of the English language. This lavish publication showcases one such instance. Sadly there is not a scrap of English anywhere in the text or in the captions. Clearly this publication is aimed at Polish speaking readers only…which is a shame. Nonetheless, there are 48 pages contained within its soft card covers. The A4 sized format is perfect for photographic reproduction and this allows the inclusion of 138 black and white images. The book is divided into four parts, with the first three being devoted to the biplanes in question. 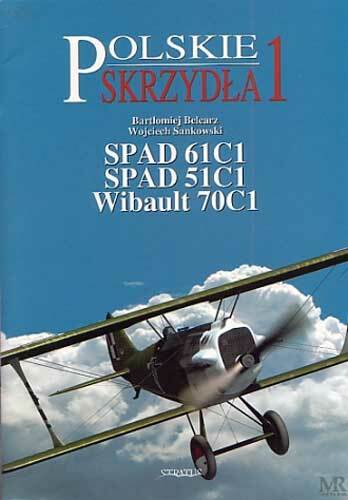 The Polish Air force operated many types of aircraft and this volume looks at the use of the Spad 61C1, Spad 51C1 and the Wibault 70C1. The final chapter is committed to the Unit markings, where we find images and a description of the different symbols used. These geometric shapes are shown in colour and a handy set of diagrams reveal the dimensions of these items. Taking the first section on the Spad 61C1 as an example, there are twenty three superb colour profiles. Some of the subjects also have additional views to highlight details on other areas of the airframe. An accompanying photograph allows the reader to make a comparison with the artwork which is a convenient feature. The Spad 51C1 and Wibault 70C1 have 10 and 5 profiles respectively, all to the same high standard seen in the earlier chapter. Each aircraft also has an admirable cockpit drawing that is covered on a single page. All parts of the “office” are carefully numbered with a table below explaining their purpose. Information on these aircraft is not easy to find and a book like this is most welcome. The layout of the book is first class as is the quality of the images. Unfortunately the lack of an English language insert means that only the local market can get maximum benefit from this book. However, even if you don’t speak Polish, the photographs and illustrations of these aircraft alone make this a worthwhile purchase.